In the early summer of 2001 I started this project on our property and it has pretty much preoccupied me in the intervening time; with the notable exception of September, October, and November. Here are a few pictures of the summer work, mainly the post and beam structural work. At the moment I am working in the interior doing all of the finish work. Scheduled completion is for the end of this summer (2002), but there will have to be breaks for two upcoming commissions in the workshop this spring. 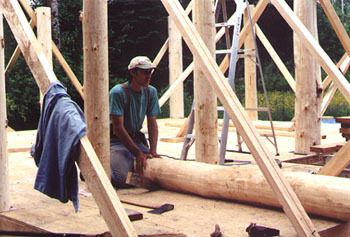 Here my friend and carpenter on the job, Brian, holds the log post in place while it is cross-cut to length. Note all of the other posts that have been placed and braced all around him. 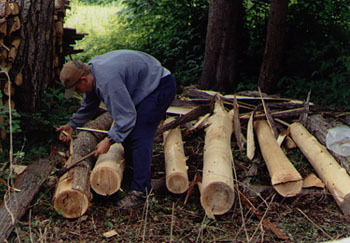 Chief log peeler, cement mixer operator, and master "Do-all", Royce, working his way through the log pile. Placing straight, parallel, square cuts into a highly irregularily shaped object required a little planing on my part. Where is that nice simple reference surface, like a jointer table, or even just a tri-square when you need it? All of these pictures are from July and August of 2001. Updates will come when the pictures arrive.